Publicado el 22 agosto 2018 27 agosto 2018 de Octavio Islas. Fundador de la revista científica Razón y Palabra. 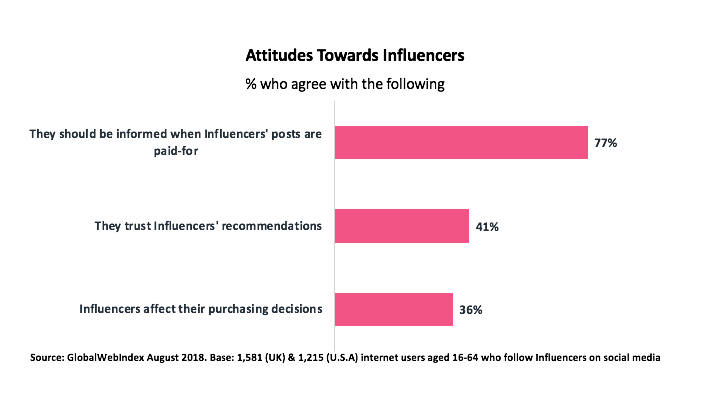 In this post, GlobalWebIndex‘s Senior Trends Analyst, Katie Young analyses consumer attitudes towards influencer marketing based on a bespoke study of 1,266 internet users in the UK and US; and looks at the key learnings that marketers really need to know. Influencer marketing has become the hottest new trend. Over the last couple of years brands have flocked to influencers to help sell their products and engage their audiences. From fitness Influencers telling you to try a new protein powder, to Bloggers promoting their favourite beauty products, there’s no shortage of personalities pushing different products. But what is the consumer appetite for this kind of marketing, and how much of an impact does it have on purchasing decisions? When we asked which categories of celebrities or personalities they follow online, food was the top scoring option. This isn’t surprising given the number of ‘foodie’ accounts around, and shows how many people head to social media for recipe inspiration and nutrition advice. Many brands have partnered with food Influencers to feature their products in their recipes. Nutrition and fitness coach, Joe Wick is one Influencer who has done just that with his partnership with Lucy Bee coconut oil. He features the product in his books and the video recipes he shares across Instagram and YouTube. There’s big opportunity for food brands to raise awareness of their products this way, but followers of food Influencers are actually less likely than followers of beauty, travel and other categories to say their purchasing decisions are affected by Influencers. This is somewhat logical, though: food Influencers are a source of inspiration for recipes, rather than a source of product or brand discovery. Two-thirds of those who follow Influencers say that they like to seek an expert opinion before buying a product, but just 35% affirm that Influencers actually impact their purchasing decisions. That said, influencer marketing is often a form of subconscious marketing; via Influencers, brands are able to affect consumers’ awareness and attitudes without them even being aware of it. Figures do vary across the social networks, though. Instagrammers (41%) are more likely than YouTube or Facebook visitors (35%) to say that Influencers affect their purchasing decisions. It makes sense that Instagram naturally lends itself to this kind of inspirational marketing and its ‘Stories’ feature has boosted this even further. The ‘swipe-up’ feature means Influencers are able to drive traffic to an optimal landing point, and Stories provide a much more realistic look into their world. Whereas feed photos look more like polished ads, someone reviewing a product in their bedroom feels much more likely you’re receiving an authentic recommendation from a friend. Trust is perhaps one of the biggest barriers in influencer marketing. Although 40% do believe that Influencers make unbiased and trustworthy recommendations, there’s still 30% who disagree with this. Brands need to be smart with influencer marketing and work to strike the right balance. They need to focus on sincerity and build long-term relationships only with those who fit in with their branding. Partnering with the wrong Influencers or too many of them could seem inauthentic and turn consumers off. Just as consumers turn to ad-blockers when sites become overloaded with ads, there’s the same risk that they’ll turn away from Influencers who aren’t genuine. Transparency is an absolute must when it comes to influencer marketing. 50% strongly agree that Influencers should make it clear if they’ve been paid to promote a brand or product on social media, and just a tiny 6% think this shouldn’t be the case. Rules are already in place to ensure this happens. The Advertising Standards Authorityhas set guidelines to ensure any work where money changes hands between brands and Influencers is clearly marked, including through the use of #ad. Instagram has also unveiled a number of new features that will allow Influencers to signpost paid for content to increase transparency. Not all Influencers accurately follow these guidelines and there have been a number of cases where it hasn’t been clear that they’ve been paid for a post. Proactive transparency of partnerships is essential for influencer marketing because it builds trust. Brands need to work harder to educate the Influencers they work with and be honest about partnerships. There’s a lot of good reasons why marketers have been allured by influencer marketing. Done right, it can be a lucrative strategy for boosting brand awareness and can provide great returns. However, it’s not foolproof, and brands need to understand the importance of authenticity and transparency when adopting this marketing strategy – otherwise, the medium that drives sales and fosters relationships could eventually drive consumers away. The post Four things marketers need to know about influencer marketing appeared first on We Are Social. Entrada anterior 13,612 The Drum Beat, What in Development works? This works!